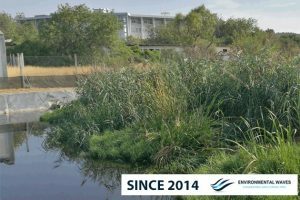 Nature-based solution to treat wastewater in Loulé – Portugal. The Nature-based Solutions uses nature and known natural processes to help provide viable solutions to protect the environment such as in the wastewater treatment. The Waves Floating System fits perfectly as a solution that uses the knowledge of nature and its processes to treat wastewater in a perfectly natural way. The growing popularity of the Waves Floating System is due to the fact that it is a solution with a double benefit, on the one hand to capture the CO2 and on the other hand to provide a natural solution for the water decontamination, without electric consumption, with low maintenance and very simple operation. Plant roots play a key role in wastewater treatment processes. The contact that is provided by the roots with the water leads to the development of biofilms containing communities of microorganisms responsible for several very important treatment processes. This symbiosis allows the removal of BOD5, Nitrogen, Phosphate and others, and its incorporation into the biomass of the plant. “During the year 2013, with a disruption in the treatment process of our WWTP, which was manifested by an increase in the concentration of the parameters of total nitrogen and nitrates in the final effluent, above the emission limit values, it was triggered a corrective action, within the scope of our Environmental Management System. Thus, in 2014 the Waves Floating System was installed with macrophytes in the maturation pond of the WWTP. In addition to the plants absorption of greenhouse gases such as methane (CH4) and carbon dioxide (CO2) and simultaneously release oxygen (O2), this action allowed an effective treatment of the wastewater, to values below 5 mg/L in both parameters and the elimination of unpleasant odours associated with wastewater treatment. 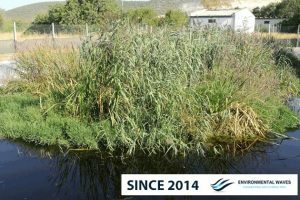 The Waves Floating System can be applied in the retrofit of conventional Constructed Wetlands, avoiding the costs associated with the removal, transport and deposition of the contaminated substrate. In a retrofit the Waves Floating System also manages to improve the treatment parameters, increasing the life time of Constructed Wetland and definitively eliminate the clogging problem.